I was inspired by the sketch at Where Creativity Meets c9 and the pink colours at Paper Players. This fab die is from Concord and 9th and the stripes are from Winnie and Walter. Again no big misti so had to eyeball these! This is a lovely bold, graphic design. Very modern and striking. Thanks for joining us at The Paper Players this week. 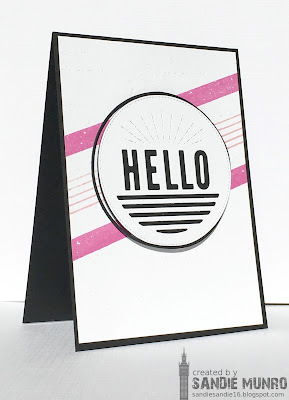 A terrific CAS card Sandie, and I love the small splashes of pink! Thanks so much for sharing with us at The Paper Players! My eye caught the same die! Love how you combined it whit the stripes! Enjoy the sunday! oh... I really like this! What a fantastic hello stamp with those lines underneath and a great design with the diagonal design! BTW...love you "movie challenge" idea!